I want a simple ratio for how many times my people called a client to get that first demo. From watching Shark Tank I know this is a key metric, they always ask “what is your cost to acquire a new customer”. This should be in the Salesforce Wheelhouse right? Not so fast, I’ll discuss some various options and ultimately share the solution we came up with. Where are Calls and Meetings stored? It’s tempting to start with the report, I’ve taken this approach, but when I attempt to reconcile the report with the data I sometimes find the wrong report type was used. By creating a Tabular Report using the Task and Events Report Type we gain insight into how the data from the Task and Event table are joined and filtered. Set the report to Show ‘All Activities’, ‘Open & Completed Activities’, and ‘Tasks and Events’. When I run the report I only pull 7 rows when I expected 6 + 2 = 8. The Task with the Not Started Status was filtered out. That happens to be great, but it demonstrates that these built in Report Types are a bit of a black box. Notice something funny? That’s right the letters are all wrong because I can’t have sibling relationships. After I select Account as my primary object I can only nest one object below it. 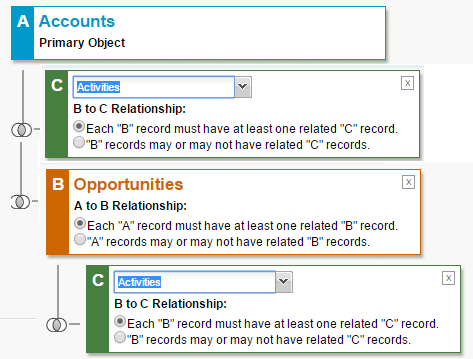 The implications is that I cannot create a Report Type that returns Activities for both Accounts and Opportunities. Previously I was working with the ‘with Accounts’ flavor and expected all of the built in report types with the same naming convention to be consistent. In this case I’m glad that they are not. I was about to resort to a Joined Report. 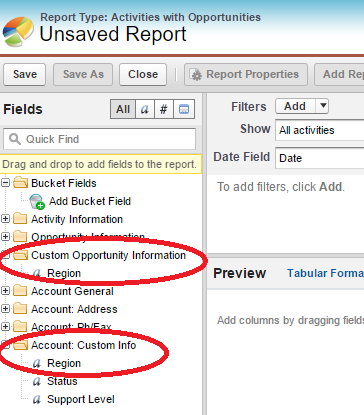 Happily this report type contains custom fields for both the Account and Opportunity object. At this point had I not checked the expected data I might be wondering whether Activities for both Accounts and Opportunities are being returned? I ran the report, they are….until I add Opportunity Name to the report. The Joined Report is fairly complicated. 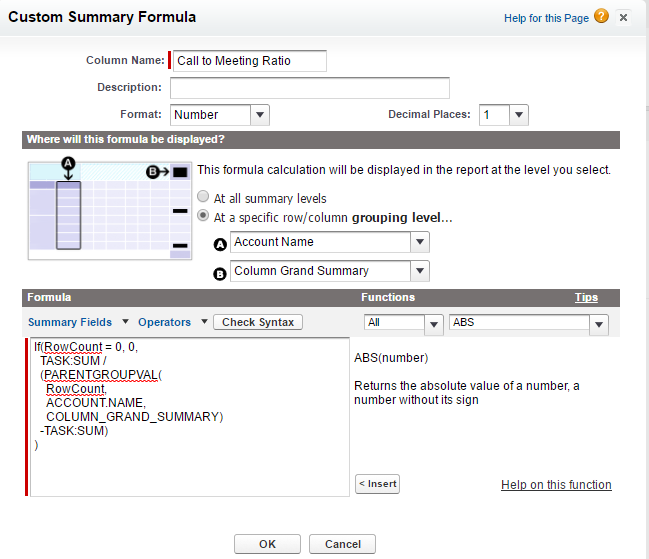 Starting out with a report type Activities with Accounts and then changing the format drop down to Joined Format the ‘Add Report Type’ button appears on the ribbon. Next add the Activities with Opportunities report type to get the two block configuration displayed. We can group by Account Name since this field is common between both report types, but we cannot group by Opportunity Name. Ultimately without this grouping we are unable to hide details and display aggregate counts for activities. I tried the ‘self-joined’ approach where I used the report type Activities with Opportunities, and then attempted to add an additional report type of the same type. The report types already in use are removed from the selection dialog so I created a custom report type. 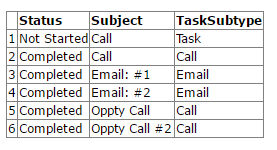 Only a single object from a custom report type is available for grouping. 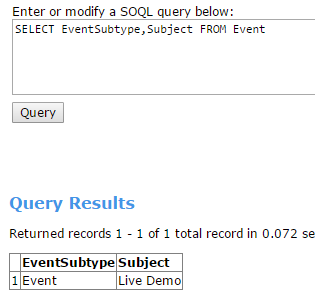 Using the built in Salesforce reporting it is not possible to aggregate values across objects. I dropped the grouping by Opportunity and built the following report. I really don’t want the Task column on the report, but if I remove it then my custom formula is also removed from the report. I would also like to remove the record counts in parenthesis, but there just is not a lot of control over the finished product. The reality is you’re doing exceptional if you can get Salesforce reporting up to 10. If your needs are greater you will likely need to install a third party reporting tool from the App Exchange, or utilize Heroku Connect in order to export and sync data to a data mart or reporting database and use a relational reporting tool. If you need guidance for finding the best tool or technique to fit your Salesforce reporting needs reach out to Statera, we would be happy to work with you. Steve MunLeeuw is a certified Platform Developer at Statera with two years of CRM development experience. Prior to working on the Salesforce platform he specialized in integration work with JBoss Fuse and worked with C# since it’s inception. When not coding he likes to explore dirt roads and watch live music. Creating a Custom Report Type for Activities, why can’t I get the activity type to display? I’m a Consultant, Should I Get My PMP?